There is a considerable and increasing interest in research related to complementary therapies to establish a base of research results which will support practice. However, not all therapies can be treated the same way, either from the same perspective of what health and treatment are, or channelled through the process of randomized, controlled trials. This book analyzes the key questions often asked and the controversies debated in complementary medicine research, and offers clear guidance written by experts in this field. 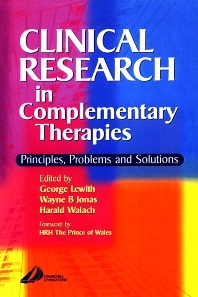 Section 1 Methods and Strategies: Balanced research strategies for complementary and alternative medicine. The role of outcomes research in evaluating complementary and alternative medicine. Inspiration and perspiration: what every researcher needs to know before they start. Possible research strategies for evaluating CAM interventions. Evaluating complementary medicine: lessons to be learned from evaluation research. Improving patient care in complementary medicine: using clinical audit. The placebo effect in complementary medicine. Conducting multicenter and large trials in complementary and alternative medicine. The importance of patient selection. Investigating the safety of complementary medicine. Systematic reviews and metaanalyses. Economic evaluation of complementary therapies. Section 2 The Therapies: Herbal medicine. Homeopathy. Manual therapies. Massage therapy research methods. Research aspects of environmental medicine. Acupuncture research methodology. Research methodology for studies of prayer and distant healing. Clinical research in naturopathic medicine. Index.